There’s not a traditional, cemetery-centered Day of the Dead celebration for tourists to see or participate in right in Mexico City. Family-focused Day of the Dead gatherings occur on a smaller scale in local cemeteries (which would be weird for you to barge in on), but you can also visit the nearby town of San Andres Mixquic (which I’ll go into below) for an experience where tourists are welcomed. But to be very clear: within the metropolis of Mexico City, you’re not really going to find what you’ve seen on National Geographic or in Coco. Also, the Mexico City Day of the Dead Parade (which I’ll also explain below) actually only started in 2016, as a response to a flood of tourist demands and disappointment upon arriving in Mexico City and realizing the parade in the James Bond movie isn’t really a thing (seriously). That being said, the markets will still be full of traditional Day of the Dead accoutrement, bakeries and grocery stores will be selling sugar skulls and pan de muerto, and plazas and hotels will be decorated. 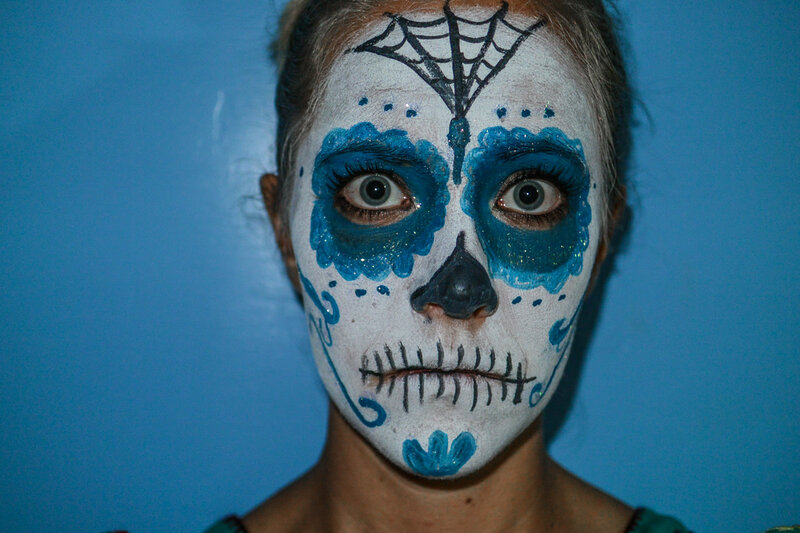 La Catrina Fest is a conglomeration of a variety of events celebrating the famous figure known as La Catrina, including parties, parades, and exhibitions that occur during the last week of October and the first week of November. Follow the Catrina Fest Facebook page for more information and to find out about upcoming events. 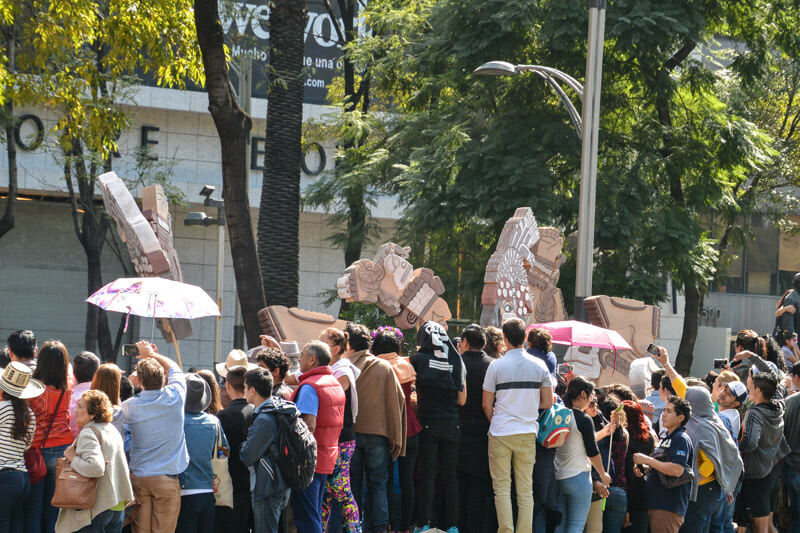 The Monumental Alebrije Parade 2018 (Desfile y Concurso de Alebrijes Monumentales del MAP) will happen on October 20. The Alebrije Parade will start in the Zocalo, and then continue along 5 de Mao, Juarez, y Paseo de la Reforma, and then end at the Angel de la Independencia. The parade is currently scheduled to occur from 12pm to 2pm, but that could change. Missing out on the exact day of the parade, though, doesn’t mean you have to miss out on seeing the alebrijes. They’re usually set along Paseo de la Reforma from Reforma 222 to Parque Chapultepec, for pedestrians to admire. 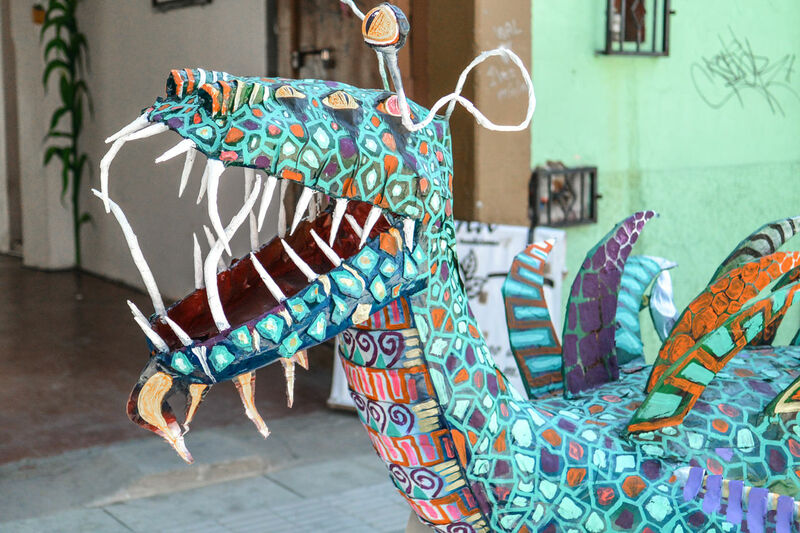 This year, the alebrijes can be seen from October 20 (after the parade) until November 4. Alebrijes are based on the work of artisan Pedro Linares, who began creating the “chimera-like”, fantastic creatures after dreaming about them while sick. Alebrijes usually contain elements of different real and imaginary animals, like multiple heads, wings, horns, and hoofs. Every alebrije is unique. If you want to experience an authentic Day of the Dead celebration near Mexico City that you’ll be welcomed into as a tourist, there’s arguably no better place than San Andres Mixquic. This is the kind of celebration you’ve seen on movies like Coco. Here’s how to get there, and details for planning your day-trip (or night-trip) from Mexico City. Another option is visiting the bohemian neighborhood of Coyoacan, which hosts beautiful decorations, ofrendas, art and sculpture exhibitions, and markets for Day of the Dead. UNAM (one of Mexico’s most prestigious universities), located in Coyoacan, also always decorates and puts together incredible ofrendas and is an awesome place to visit to learn more about the history and symbolism of the tradition. This year, Mexico City’s Day of the Dead Parade 2018 is scheduled for Saturday, October 27. 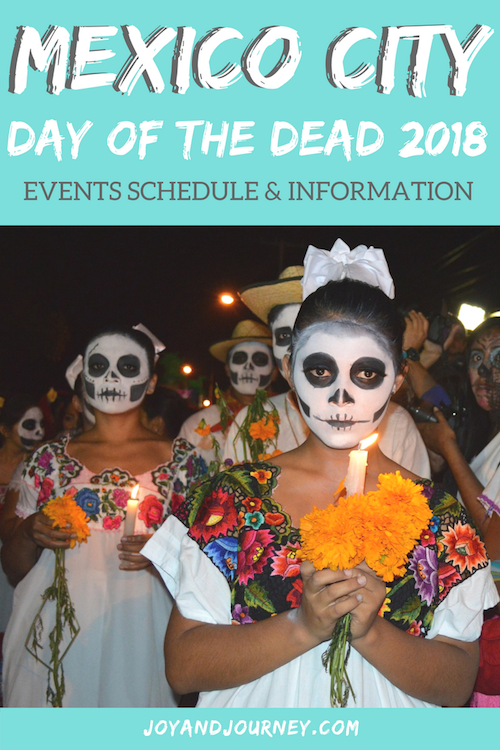 The Day of the Dead Parade will occur from 11am-4pm, starting at Estela de Luz and ending at the Zocalo. First and foremost, be aware that the date for the Day of the Dead Parade is not set in stone. Last year, the “official” published date and time changed 5+ times, including less than a month before the parade. The year before that, in 2016, the parade started hours late. If you want to be absolutely certain that you’re in Mexico City for the Day of the Dead parade, arrive at least a week before Dia de los Muertos (November 1 and 2) and stay for a week after. People start queuing up to get a good spot to see the afternoon parade from the early morning. If you want to be able to see the Mexico City Day of the Dead parade, you’ll definitely want to arrive early (bring a blanket to sit on, some snacks, and water), or get creative with scoping out a rooftop/ high-level bar or restaurant to pass the time at. The whole historic area may be closed to traffic for most of the day and into the night, so be prepared to walk quite a bit. Wear comfortable shoes and carry water. The whole area will be crowded (and prime for pickpockets) so either keep your valuables at home or use a theftproof purse or backpack. Note: This year’s parade was held in memory of migrants who have lost their lives. Wondering which neighborhood you should base yourself in during your time in Mexico City for Day of the Dead 2018? I wrote an extensive guide to my most recommended Mexico City neighborhoods here. If you’re looking for other activities to get up to during your visit to Mexico’s incredible, underrated capital, check out this article, which features more than few local hidden gems that you won’t find in other guides. Lost on what to wear or what to pack for your trip to Mexico City? I’ve got you covered in this piece! If you know of other Day of the Dead events in Mexico City for this year, please let me know and I’ll add them! Thanks for sharing! 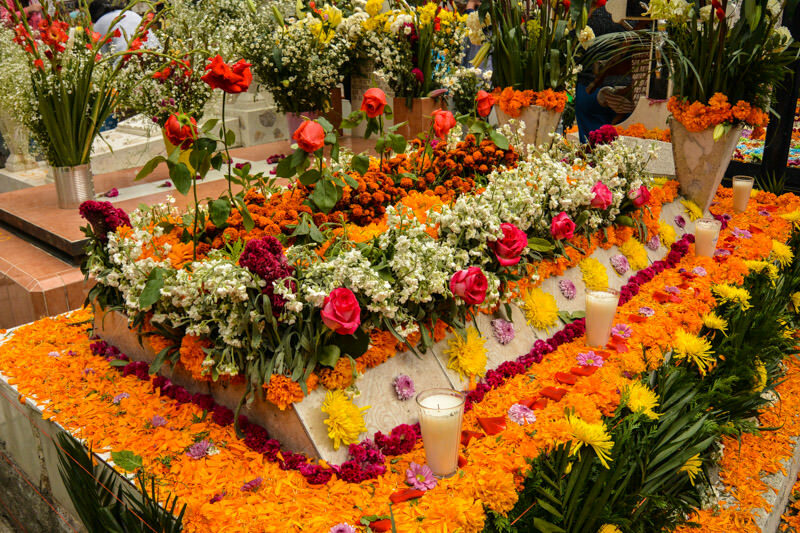 How many days before the actual Day of the Dead day can we visit UNAM’s ofrendas? Hi Jean! That varies year to year and I’d recommend contacting UNAM for the most accurate information. Enjoy your visit! Thank you so much for sharing the beautiful post.